HP+ is supporting PEPFAR country teams to conduct legal environment assessments (LEAs) and develop advocacy reform plans to address LEA findings (a process called HIV Policy Scan and Action Planning), fulfilling requirements outlined in PEPFAR’s 2016 Country/Regional Operational Plan (COP/ROP) Guidance. Respecting a need by country stakeholders for a simple, specific, engaging, and cost-effective LEA approach, HP+ uses a mix of desk work, short-term technical assistance, and in-country expertise to apply the project’s unique HIV policy scan and action planning approach. The approach allows PEPFAR country teams to analyze existing HIV-related policies and their implementation; identify and prioritize HIV service gaps related to the continuum of HIV prevention, care, and treatment; and engage stakeholders to develop, monitor, and adapt country-specific policy, regulatory, and legal reform action plans to achieve treatment and other HIV response targets. 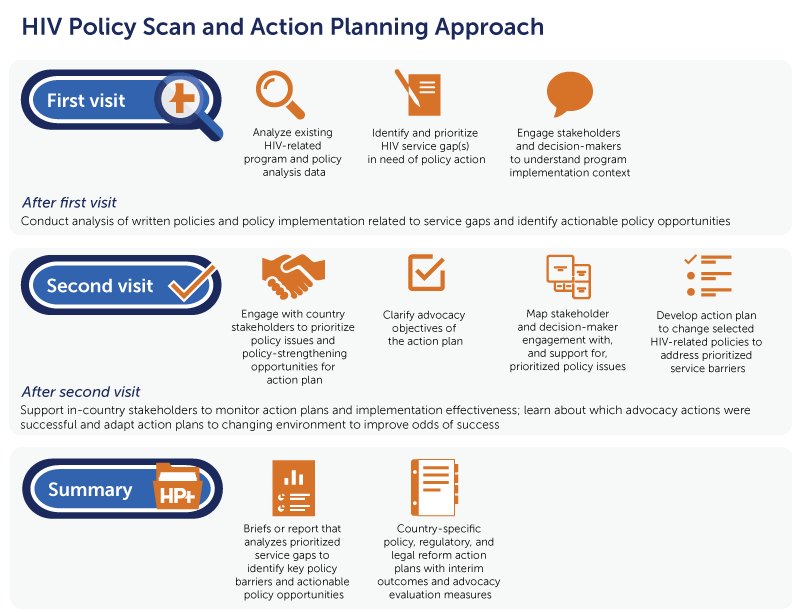 Using HP+’s participatory HIV policy scan and action planning approach, we provide PEPFAR country teams with an analysis of the current policy environment, how various policies are being implemented, and existing HIV service gaps. The process includes a review of legislation, government strategies, national policies, clinical guidelines, and/or standard operating procedures and various stakeholder engagements. This approach allows in-country stakeholders to take part in the process with support from HP+ senior technical staff that have experience in the continuum of HIV prevention, care, and treatment policy analysis and facilitation. Stakeholders are also involved in developing action plans based on the recommendations from the analysis. Specific. The approach allows in-county stakeholders to identify targeted priorities that are relevant to their country context. Simple. Clear guidance and strong facilitation help in-country stakeholders interpret existing program and policy analysis data and address policy gaps. Engaging. A flexible approach engages host-country governments, civil society, donors, and U.S. Government stakeholders to define priorities, identify data sources, analyze information, identify resource needs, and secure commitments for action. Action-oriented. Action plans are politically feasible, technically sound, and based on critical country priorities. They identify near- and mid-term outcomes to achieve advocacy objectives and are monitored and adapted to changing needs.